really wanted to totally recreate it as best I could, have lots of super tiny blocks, do the same quilting design, etc. It quickly became apparent making super elaborate tiny quilts wasn’t where I wanted to go. Then I was listening to this Alex Anderson podcast Jen sent me to on doll quilts and the gal she was interviewing was talking about how doll quilts were always made very quickly and were often quite basic because they were meant to be played with by children. And that sounded a lot more on the money to me. So I made bigger squares, did real simple machine quilting and used twill tape for binding. I always have a hard time with the intentionally imperfect look but I think it turned out cute. I dig it. It’s tiny though, 15″ x 18″. Next one should be bigger. One down! Thanks for the Stitchette love the past 2 days! I’ve been to the post office 3 times since yesterday and they should be landing at their destinations shortly. Next on the horizon, the snowsuits. And then the make-a-long knitting patterns. Speaking of which, I’m looking for a very nitpicky knitter with some time on her hands, any takers? I am loving your doll quilt nursery concept. That magazine photo you posted for a second time a few days ago is inspiring and I can’t wait to see your interpretation for the nursery. Please keep showing us the amazing little quilts you are creating! The quilt is really delightful. It’s very lively. I might be able to help you with your knitting. It’s beautiful, I love that. It has such an antique look to it already. It’s going to be a great room. I’d love to help with the knitting! The quilt is beautiful. I’ve been wanting to learn to quilt, but too intimidated — I think doll quilts may be the solution. Really lovely little quilt. Can’t wait for my Stitchettes to arrive. the mini quilt is just adorable. A little bit of pink! Yay! Thanks for sharing your wonderful talent with all. Just perfect! How on earth did you make it look old, used, worn out and loved already? Soooo cute! This is a beautiful little quilt. I can’t wait to see how the collection progresses. i was wondering about the doll vs mini quilt deal– thanks for clearing that up. 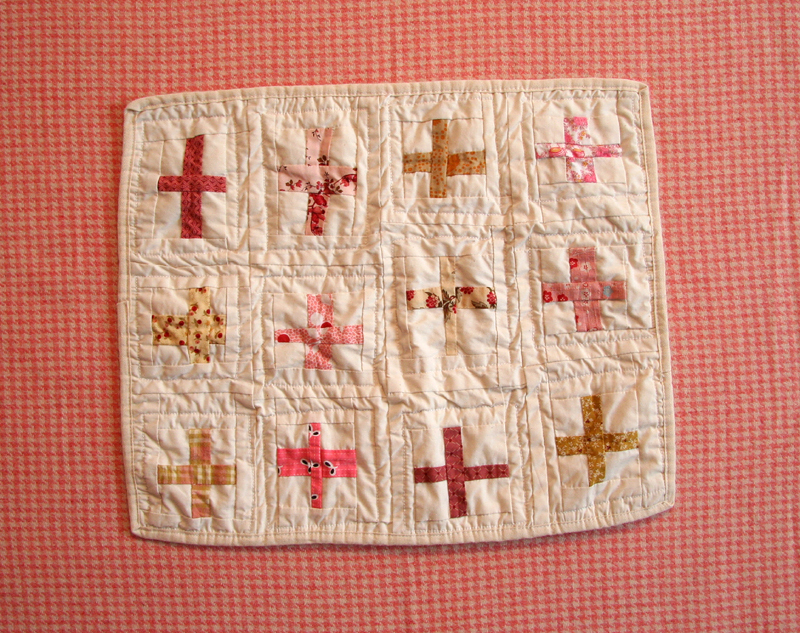 the rustic quality of the doll quilt is really appealing and less freaky than the obsessiveness of the mini-quilt as decoration. this one is so good. I’d be happy to help you out with knitting. I’ve been knitting tiny sweaters with sock yarn and size 2 dpns. Talk about nitpicky! I love this- colors, subtle pinks…just beautiful. how many are you planning to make? Like everyone else has said, lovely, so cute! That’s just the style I admired from the quilt show pics I saw, very cool! That is so completely sweet. You did a beautiful job. I love this quilt so very, very much. Hillary, the concept is fabulous, and the quilt is adorable! Now I really want to do this in Little’s room, too. Mind if I borrow your idea? Hope you’re staying warm out there. Glad to see that satellite is behaving again. it’s fantastic in its small sweet slightly-wobblyness! I’ve got a doll quilt project planned for my girl’s birthday this spring, so I’m particularly looking forward to watching your tiny quilty vision unfold. love the quilt! i know that wall you are creating is going to be fabulous! i’ll knit for you if you still need someone. Love the tiny quilt! So cute!!! I’ve been knitting for 15+ years and am a *total* perfectionist. I’ve been known to frog half-finished (and occasionally completely finished) garments just because I felt it didn’t look quite as it should! My husband thinks I’m crazy. I have a feeling he may be right. Also, I can knit at work and no one cares…all this to say, I’d love to help you knit up some samples if you still need extra hands! What a wonderful start to your doll quilt bonanza. Looks like you’ve got plenty of volunteers but I can be a knitting guinea pig if you still need one. I’m in little quilt love. 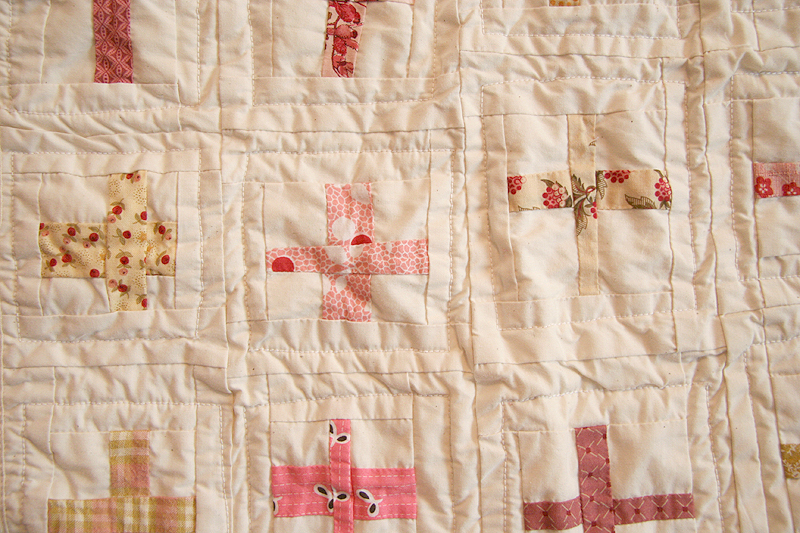 The doll quilt is fabulous–makes me want to be little doll so I can cuddle under the quilt. I’m a beginning knitter so I can’t help you with your project but I do look forward to seeing what it is. I see 30 comments already, so don’t know if you’re still looking, but I’d love to test knit some things for you. I do quite a bit of test knitting for other designers, so let me know if you want my help! I’m up for a knitting gig:D Let me know if you need someone. I love the quilt too! I have been really into crosses lately (like the red cross’s cross). I have been planning on making a patchwork pillow with a patchwork cross. You are such an inspiration! I better get on it! The quilt is just gorgeous! You’ve done a wonderful job on it. Can’t wait to see what comes next? I’d like to know when the quilt tutorials will begin. The quilt is truly adorable and will be well loved by many a doll and little wee one. I’ve been trying to figure out how to make one for ages. Time to hit the library books for some help! Beautiful. The biggest challenge for amazing doll quilts is getting the scale right – what a perfect choice! this turned out so crazy good-I swore when I saw it on flickr! must listen to that podcast now. .
and the colors are so wee-perfect. Gosh this is so cute and you are so FAST!!! I don’t understand, with all the other stuff you’re doing plus being a mom….?? I adore this concept for the room–this will be a Very Lucky little Girl!!!! it looks amazing! you are a doll quilt genius! I am so glad to have read your posts about doll quilts lately. I have been obsessed with doll quilts and thought I was crazy..that I was the only one. Anyway, I love the one you made!..more obsession. Totally and completely beautiful! I love the idea of shrinking down something you really like, like a big quilt, into a little piece of beauty. wow! this is really good! 🙂 i would LOVE to make one of these! especially love how the little colour bits are only accents and not the whole patch! this is so cute I want to eat it! or something. How many do you plan to make? Bigger? Make it any bigger and it wont be a doll quilt – it will be a cot quilt – I’ve done one for a dolls house which was 3″ by 5″ – now thats tiny! I’m totally inspired to make one. Your pattern is fabulous. My great-grandma used to make me doll quilts and I still have them. I use one of them sometimes as a dresser ‘scarf’. Yes, you definitely stuck the landing. That was my favorite among the Tokyo quilts. I think it turned out beautifully in pinks. i love the doll quilt nursery idea! Oh, Hillary! It is just so sweet! It’s giving me an urge to start sewing again. Miss Elsie needs some quilts and blankets for her dollies. I can’t wait to see your next one. Your quilt is so wonderful. This tiny doll quilt is perfection. I want to make one out of japanese taupe fabrics. I have a few Dear Jane quilt blocks done up in taupes, I wonder if they would make good doll quilts? hm….let me know what you think! I am working on little quilts too! yours turned out so fantastic. Can’t wait to see more. Very pretty! I like its simplicity. Seriously seriously cute. Can’t wait to see more! Such a cute design. I love how antique it looks.